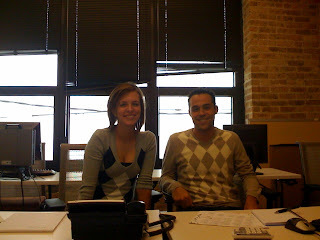 On their third day of work, the Resolution Media interns (Megan & Marc) are already fitting in nicely. Unknowingly, they created Intern Argyle Day today, which has forced us to institute a new policy that they must coordinate outfits everyday because it's so dang precious. Keep up the fine work! I hear J. Crew is calling Marc for this great ad.